ThisIsCarpentry.com recently published a great article on a DIY cabinet jack system that I just love. 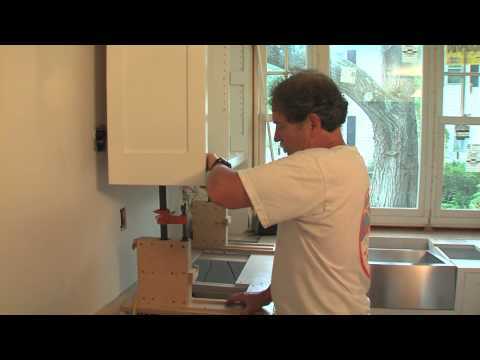 If you have ever installed upper cabinets, you know you need some type support system to help you to get those cabinets exactly where you want them. For your everyday homeowner, you can get away with using a simple ledger board, but we pros need something that will not damaged the walls and can be used over and over again. There are many options including things as basic as 2x4 kickers all the way up to multi-hundred dollar cabinet lifts. But sometimes the homemade version is the best version. The jacks from the article come from Greg Soper, who was looking for strong and sturdy lift that would allow him to scribe his cabinets in place without having to remove them. Some people like to set their upper cabinets first and some like to set the base cabinets first; both methods have their pros and cons, but in the case of this jack system you will have to set your base cabs first. Greg's system uses a simple homemade plywood box with a hole in the top that allows a spreading type pipe clamp to fit inside. With the clamps set inside, all it takes is a couple of turns of the adjustment knob to get everything leveled out. Check out the video after the Read More for a complete demonstration. ThisIsCarpentry has more information and photos for your reference on building your own.